A Coast Guard Air Station Kodiak HH-65 Dolphin helicopter crew conducts a survey of the grounded 86-foot fishing vessel Midnite Sun. 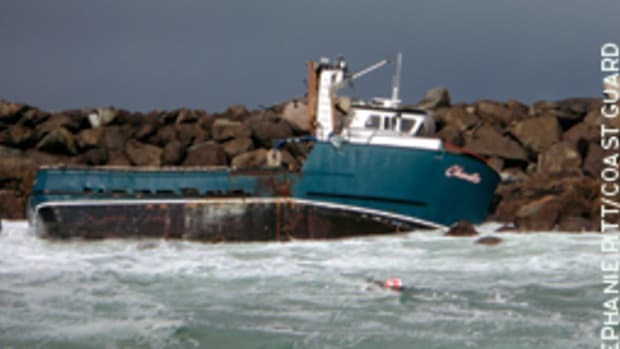 The Kodiak (Alaska) Daily Mirror reported that four of the boat&apos;s six fuel tanks ruptured and that an estimated 4,000 gallons of diesel fuel had spilled. No environmental effects were reported. Stewart Graham, 93, of Portland, Maine, was designated Coast Guard Surfman No. 68 in a March 11 ceremony at Coast Guard Sector Northern New England. A former commander, Graham joined the Coast Guard in 1937 as a surfman, but at the time there was no official registry of people who achieved the elite qualification. Coast Guard surfmen are part of a tradition of lifesavers that dates from nearly 200 years ago. 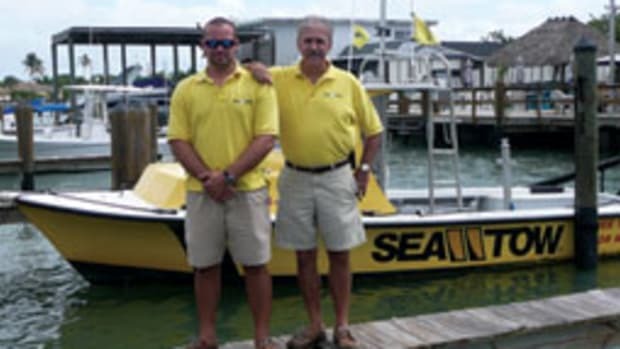 Today the agency uses the surfman designation for its most highly trained boat operators. Graham went through flight training and became a Coast Guard aviator in 1941. He is Coast Guard Helicopter Pilot No. 2 - the second helicopter pilot ever to serve in the agency. He was decorated as an aviator, earning the Distinguished Flying Cross and two Air Medals, among other honors, during a 25-year career. He also established a number of aviation firsts. 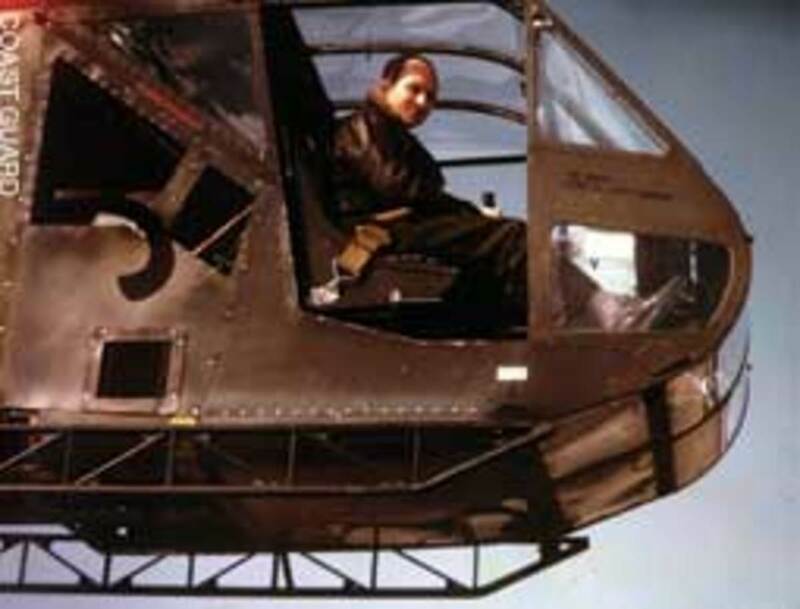 He piloted the first helicopter takeoff and landing aboard a ship, was the first helicopter pilot to rescue survivors from the sea, and piloted the longest unescorted helicopter flight in the world at the time. He completed a transcontinental flight in 1949 from Elizabeth City, N.C., to Port Angeles, Wash., in a Sikorsky HO3S-1G rescue helicopter. Graham has been inducted into the Naval Aviation Hall of Fame in Pensacola, Fla., and the Coast Guard Aviation Hall of Fame in Mobile, Ala. The Coast Guard cutter Elm rescued four people Feb. 27 when their 27-foot boat capsized 20 miles off Cape Hatteras, N.C. Coast Guard watchstanders received a radio call from the boaters at 2:50 p.m. that said they were taking on water. The 225-foot buoy tender Elm was diverted from normal operations and arrived at the scene at 3:12 p.m. In addition, a rescue-boat crew was launched from Station Cape Hatteras. "This case represents the effective use of safety equipment, including life jackets and a hand-held VHF radio, that saved four lives today," says Craig Sanders, a command duty officer at Sector North Carolina. 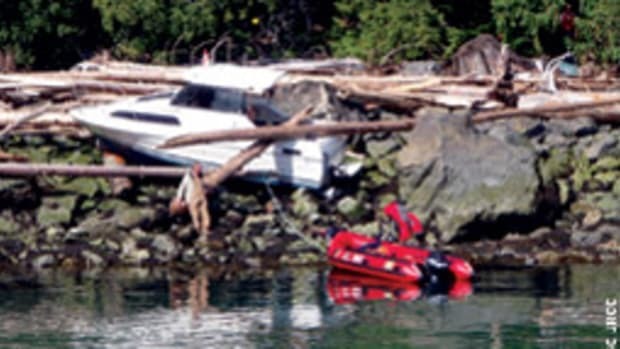 "The Coast Guard&apos;s Rescue 21 system was able to confirm the location of the distressed mariners by triangulating their VHF mayday call, allowing the Elm to arrive on scene before hypothermia could set in." 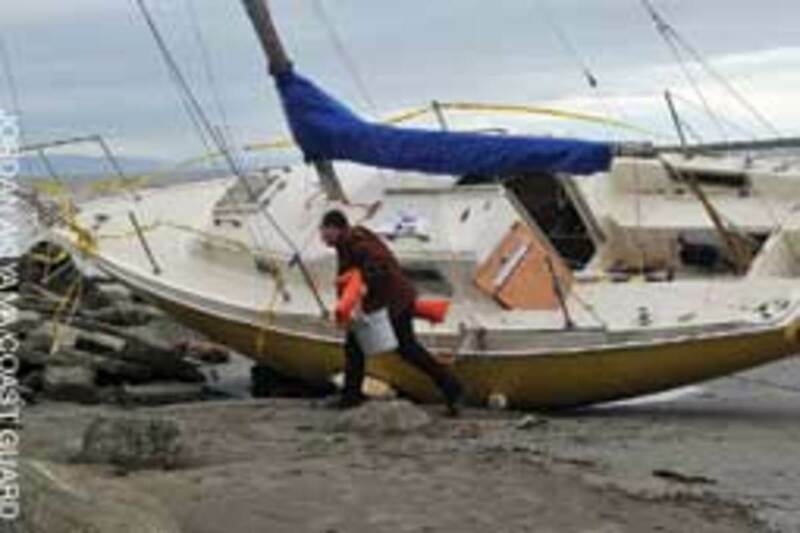 A man removes items from a friend&apos;s sailboat, which washed ashore in Crescent City, Calif., in seas kicked up by the March 11 earthquake off Japan. Tsunami waves damaged or sank many boats on the West Coast, with 16 sinkings reported in Crescent City alone. Coast Guard and Florida Fish and Wildlife Conservation Commission personnel responded to a collision March 1 south of Stock Island, Fla. About 7:15 p.m., Coast Guard watchstanders at Sector Key West were notified of a collision between the 85-foot stern trawler Pirate&apos;s Pride and an anchored 17-foot recreational boat. The 17-footer sank, and its four occupants went into the water. 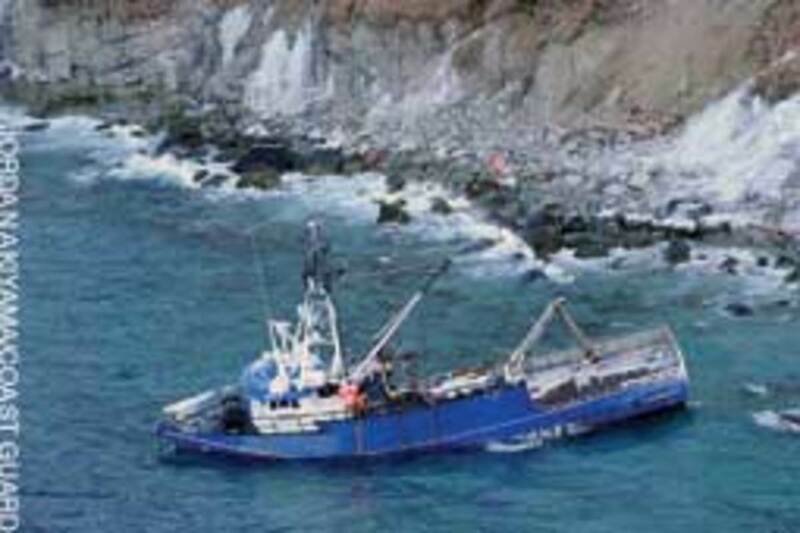 The Pirate&apos;s Pride crew immediately recovered three of the people, and the fourth was recovered by the Coast Guard. No injuries were reported. The collision was under investigation. 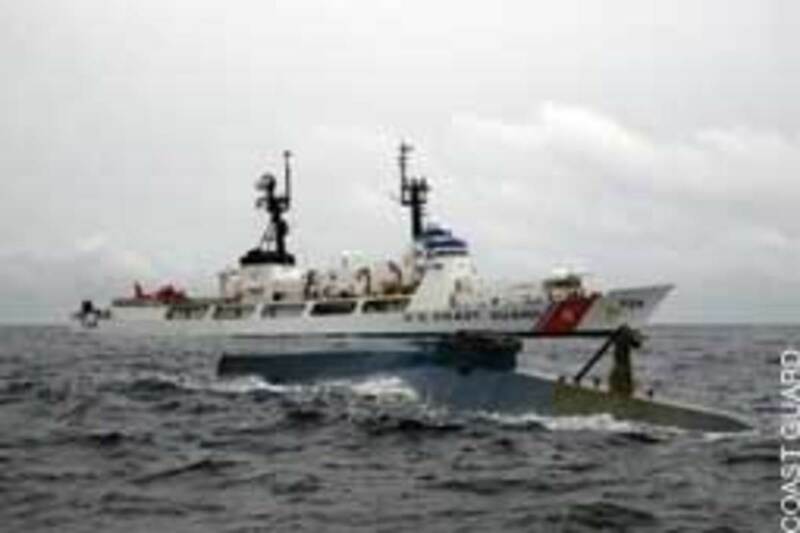 The Seattle-based Coast Guard cutter Midgett intercepted a 35-foot, self-propelled semisubmersible carrying 300 bales of cocaine - approximately 13,000 pounds - 335 miles off Costa Rica Jan. 20. When law enforcement personnel arrived, the Midgett dispatched a boarding team, attempted to hail the vessel in English and Spanish, and knocked on the hull with no response. Three hours later, the hatch atop the central conning tower swung open, and one of the crewmembers slowly emerged. 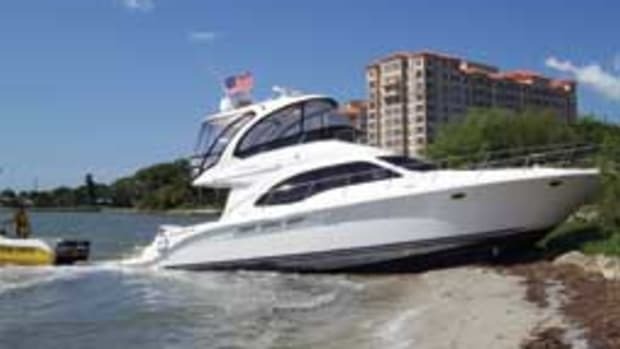 The Midgett&apos;s law enforcement team closed with the vessel and ordered all personnel onto the hull. SPSS crews are known to scuttle their vessels upon evacuation, so the Midgett immediately put a second small boat into the water. The two law enforcement teams quickly brought all four crewmembers aboard the cutter. They said the vessel was from Colombia. The Coast Guard assisted a disabled Netherlands-flagged freighter with nine people on board 70 miles southeast of Cape Cod, Mass., Feb. 26. The 432-foot Dintelborg, en route from the Netherlands to Willington, Va., lost propulsion when a small fire broke out on the bridge. The fire was extinguished, and no injuries were reported, but the ship was left adrift and with no ship-to-shore communications in 16-foot seas. An Air Station Cape Cod MH-60 Jayhawk helicopter arrived on scene at 2:52 a.m. and established contact with the crew of the freighter, who used a hand-held radio to communicate. A Coast Guard HC-130 Hercules from Elizabeth City, N.C., relieved the helicopter to relay messages from the ship to rescue coordinators on shore. 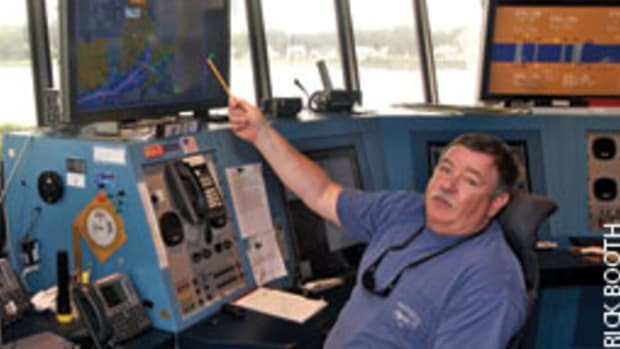 "The ship is seaworthy, and the good news is none of the crew have been hurt," says Lt. Adam Schmid of the First District Command Center in Boston. 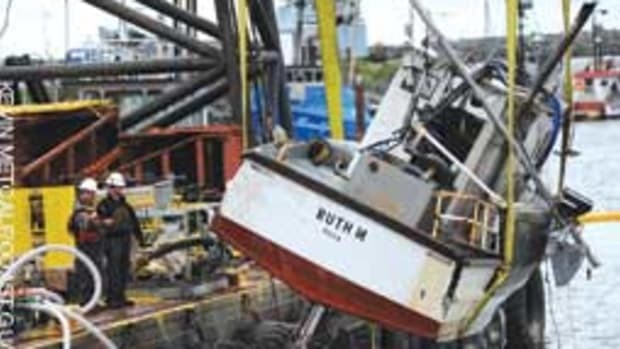 The tug Rowan McAllister from New Bedford, Mass., planned to tow the ship to Providence, R.I. 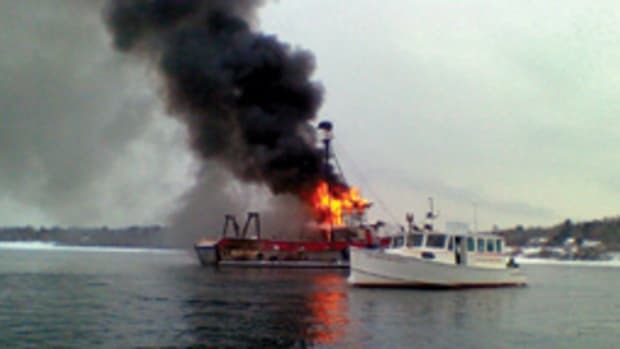 The cause of the fire is unknown, and the Coast Guard was investigating. 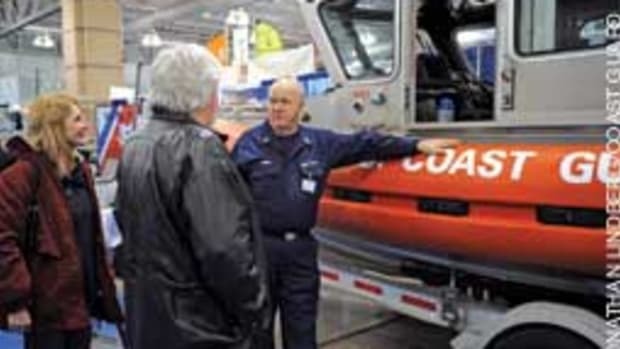 The Coast Guard Sector New York Command Center received two probable hoax calls in one week earlier this year. In one instance, the person made a statement of distress but did not respond to replies for assistance. The agency later determined the call to be a hoax, though not until local authorities had dispatched rescue crews. The Coast Guard stresses that making hoax distress calls is punishable under federal law and could include monetary penalties or jail time. "When we hear mayday across the radio, it&apos;s our duty to respond. If there is a chance that someone is in distress, we want to get out there and help them," says Ensign Tim Kessell, a command duty officer at Sector Long Island Sound in New Haven, Conn. Coast Guard rescue helicopters cost taxpayers about $2,282 an hour to operate, and the cost of rescue boats ranges from $1,120 to $2,740 an hour, depending on the vessel. A hoax caller who is identified and found guilty might have to pay those costs.